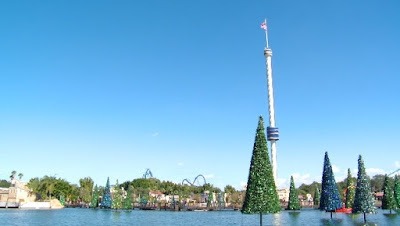 ORLANDO, Florida - It’s the most wonderful time of the year again at SeaWorld with waves of holiday spirit, seas of trees and twinkling lights during SeaWorld’s Christmas Celebration. On select dates beginning Saturday, November 21, 2015, guests will enjoy this wintery, watery wonderland and entertainment inspired by the natural world and holiday cheer. Guests can journey to the North Pole on THE POLAR EXPRESS Experience where they can meet Santa Claus. Guests will also be entertained with special holiday shows such as Shamu Christmas Miracles, Elmo's Christmas Wish with Sesame Street friends, and the Winter Wonderland on Ice ice-skating performance. These holiday shows are already included with regular admission. In addition to the live performances, SeaWorld will once again display its Sea of Trees with more than 100 Christmas trees sparkling to music and lighting up the water. SeaWorld's Christmas celebration takes place Nov. 21-22, 27-29, and Dec. 4-6, 11-13, 18-31.